Over the years, the many dedicated fans of this outstanding game by Looking Glass Studios and Irrational Games have stepped forward in the community and used their talents to better a cyberpunk cult classic that we continue to honor 15 years after its debut. 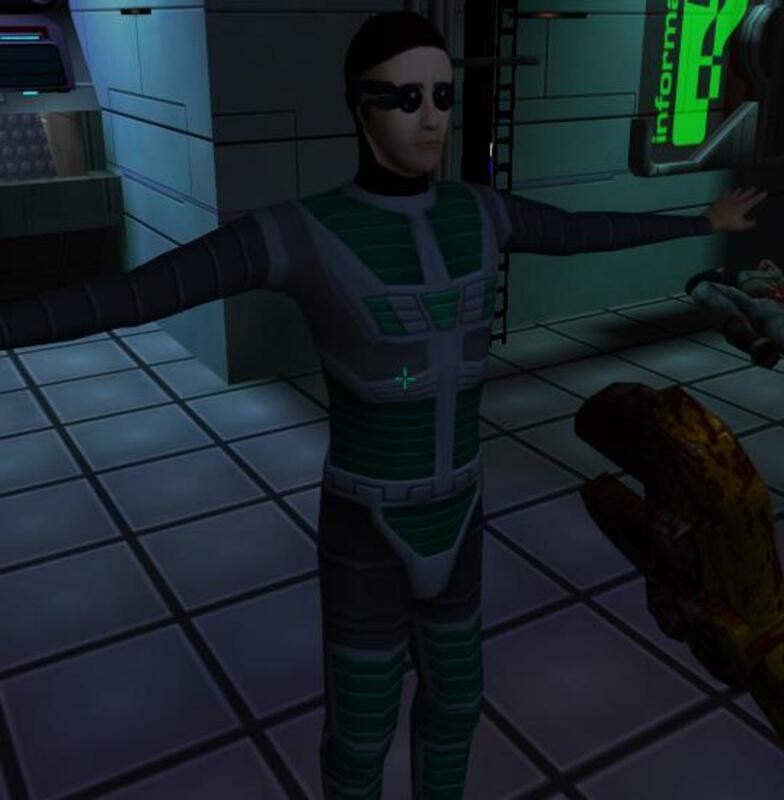 Of course, these System Shock 2 mods vary in quality and style, but it's admirable to see so many willing to contribute their works so that others may continue to enjoy this game with a fresh, modern feel to it. 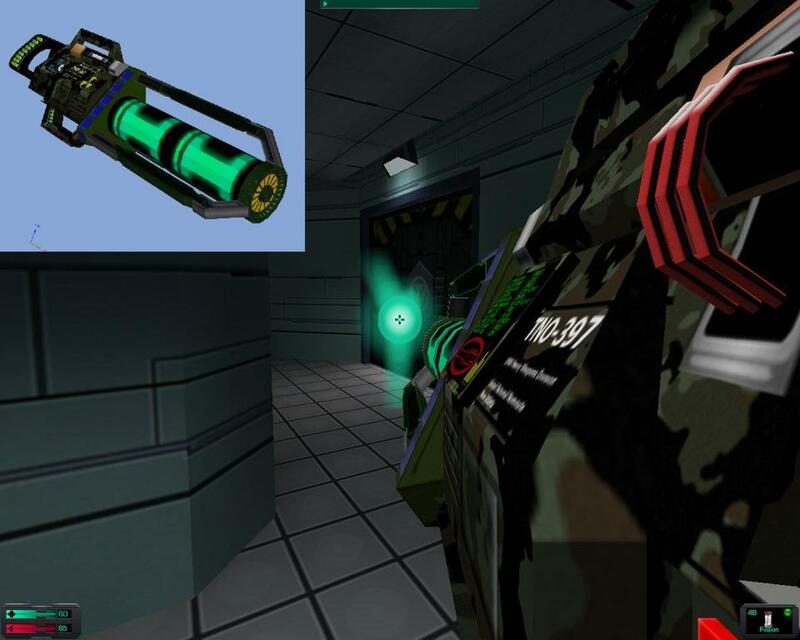 If you're a fan, no doubt you already know about sites like SShock2.com, TTLG.com and also SystemShock.org, a community forum and mod repository containing several pages of archived files, published by users stretching back to the very beginning. Even as an active member on these boards, I find myself overwhelmed by the sheer number of options I have for gameplay alterations, weapons, sounds, graphics, multiplayer, you name it! I find myself creating DVDs with pre-patched images of System Shock 2, so I don't need to bother wading through all the mods the next time I play the game. Even still, I come back a year later only to find some mods updated, others replaced, and still, others added from young, motivated and talented individuals who want to share in the enthusiasm we all felt when we first took a stab at bringing this old game up to today's modern standards. I'm going to do my utmost to clearly and concisely summarize and categorize all of the best quality mods I've come across so that you don't have to do the research. Besides there's only so much, you can learn by reading the author's description and then you have to take a blind leap of faith that it won't ruin your gaming experience, especially if you haven't played in a long time. It's my hope that this guide will give you a level of confidence to pick the mods most suited to your personal taste so that getting back into System Shock 2 feels as natural as possible and yields the greatest reward to you after more than a decade of refinement. Popularity: This will be either low, medium or high. Not that I mean to say that low is "no good" or that mods not listed here are undesirable. 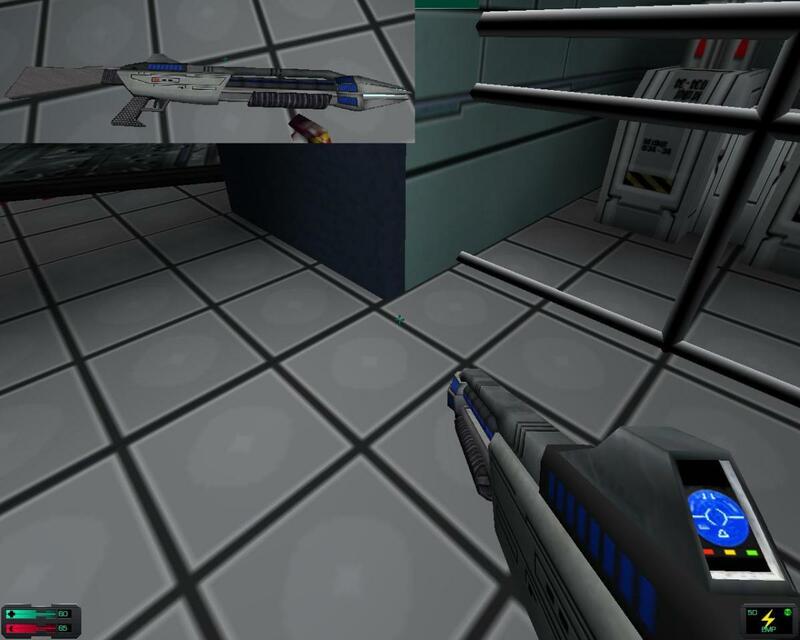 On the contrary, as much as I would like this to be an exhaustive index of System Shock 2 mods, it would become cluttered and counterproductive to list them all, as this article is designed to simplify the indexing and categorizing process. Popularity, in the context of this article simply indicates the relative weight users give the mod above and beyond what you might consider average, as well as the volume of downloads. Category: I have split everything into a few main categories which are Game System, Gameplay, Textures, Audio, Models and Novelty. This gives you a rough idea of what the mod changes and how it complements or differs from the others. Main Author: There isn't always 1 author, but the 1 or 2 listed here are the most recognized leaders if you will. Please see the full list of contributors for each mod however because there is a lot going on behind the scenes and sometimes several hard working people have made a mod what it is today. Style Change? : This indicates how "different" the game will feel from what you are used to without the mod. Style changes are somewhat subjective, but usually, they deviate from what the original game designers were shooting for if you ignore the technical challenges they faced at the time (like low-quality graphics for example). Compatibility: Some mods can be downloaded and dropped in a directory, without regard for any other mods that may or may not be installed. 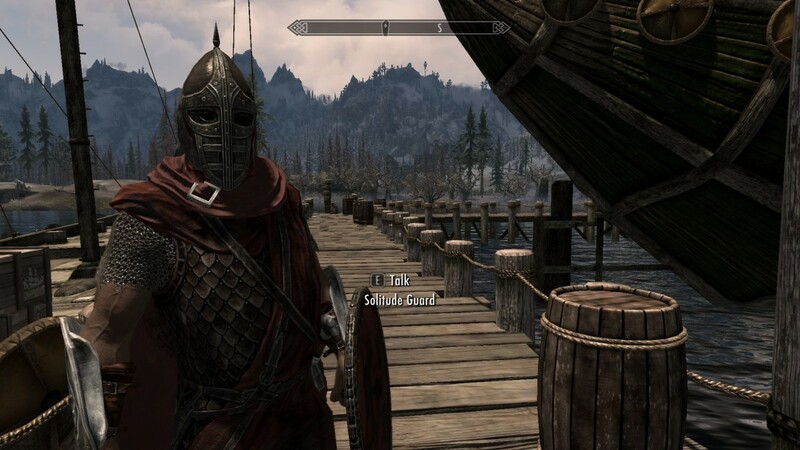 These mods will work immediately no matter what else you've done to the game. Other mods can only function properly by themselves or have some other limitation that you must be aware of ahead of time, so you don't break something by installing 2 mods that aren't meant to work together. Most gameplay mods are like this. Effect: This simply describes what the mod does in a few words before going into a lot of detail. All mods listed below can be downloaded from https://www.systemshock.org/index.php?board=2.0 which is the "SS2 Modifications" sub-forum. Also be aware that in order to describe some of these mods, there will be some spoilers. They won't be big spoilers, but there will be some little ones. This guide only contains true mods, and while there are some works that modify the game in some major way, they may also heavily extend, redo or modify the plot, in which case it would be better classified as a fan mission, which is why it isn't covered here. A category like that is outside of the scope of this page because you could speak volumes about each fan mission if you wanted to. Here we're mostly interested in stuff that you can apply to the "original" game experience. This isn't really a mod. It's more of an installation tool. 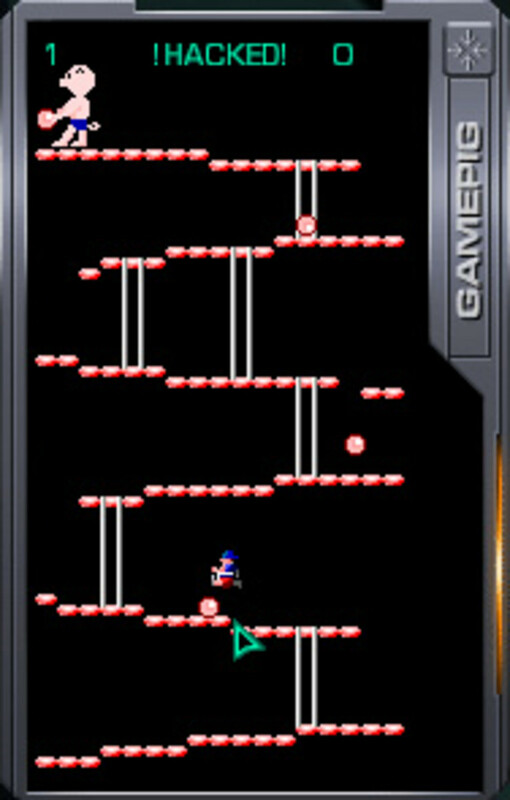 It's a very organized and easy way to install the game on a modern system without having to manually apply patches and fixes and work-arounds, all of which have become quite complicated over the years as computers have become more advanced and more spit and glue became necessary to make the game function properly. It includes NewDark and all the drivers, patches and bug fixes that make the game fire up correctly. This is what you would call a "fresh install". 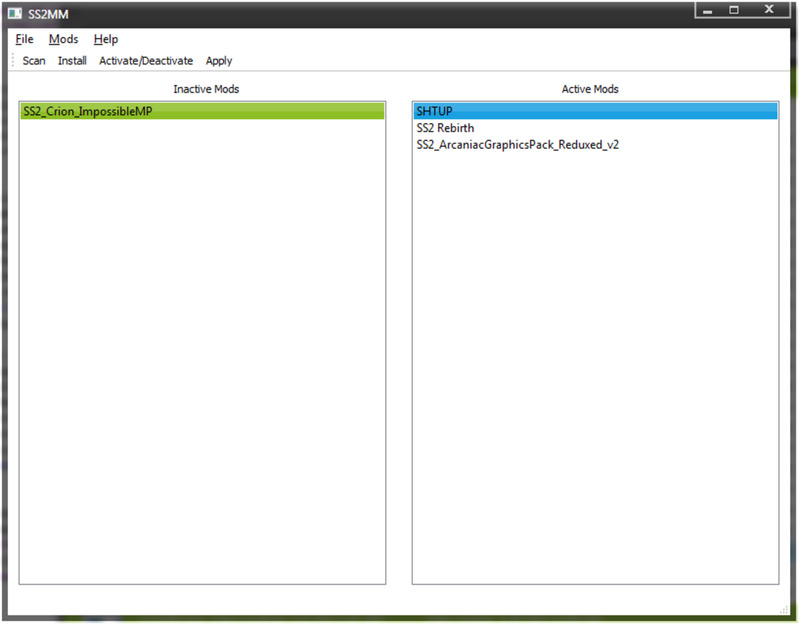 What you do after having installed SS2Tool is up to you. This tool also sets up all of your folders nicely so that adding mods is more "plug-n-play". You can still install the game without this by the way but it's cumbersome and no longer being encouraged. Compatibility: Changes the game at a fundamental level. Old saves won't work. Effect: Fixes tons of bugs, better graphics, sound, game code, features, editor, the works. This mod came out of nowhere (literally... we don't know where it comes from except that the author calls himself Le Corbeau) and shocked the SS community (see what I did there?). It's made of pure awesome... and sprinkles on top. All we know is that at some point, the Dreamcast development kit source code leaked (unofficially) onto the internet. Some time after that, someone, somehow started messing around with it and was able to re-construct everything for the PC and fix a HUUUUUGE amount of bugs AND add amazing new features like DX9 support and post processing, new gameplay code that affects things as fundamental as walking and mantling, sound, lighting, you name it. Then he dropped it in our laps and disappeared into the woodwork again. The mod is not really a mod but a replacement for the core game code. It replaces the exe file among other things and the editor too, which also sports the same fixes and features. For all intents and purposes, this is SS2 all over again, rebuilt from the ground up for the 21st century. It's included in Kolya's SS2 Tool to make the installation seamless so if you want this (and why wouldn't you) you don't have to do much except download the same tool you'd be downloading anyway since SS2 Tool is the easiest way to get SS2 running on a modern machine. Effect: Enables the user to fine-tune mouse sensitivity to a higher degree and eliminates X-Y sensitivity differences. This mod basically makes mouse sensitivity the same, regardless of screen resolution or whether you're looking up-down or left-right. The mouse movement calculations are more accurate and the sensitivity bar in the game settings is more detailed, allowing a finer tuning of sensitivity than before. You just have to back up 1 .dll file and paste this mod into your game directory. This stands for System shock Community Patch and is similar to ADAOB but grander in scope and is meant to work with NewDark and exploit its features and benefits. Like ADAOB, it aims to fix a lot of the non-game-code bugs that are inherent to the game "system" (or gamesys for short), the maps and other game resources. Balance adjustments are also on the table although only where absolutely necessary and some redesign of certain game segments that were poorly done, broken or stupid are meant to maintain gamer immersion in areas where they did not previously. This has been the status quo for mods that attempt to fix and re-balance the game. A member named Straylight put an enormous amount of time into analyzing and documenting (an absolutely huge readme) every little observation about everything he found wrong or biased in the game. He performed experiments, made tweaks, commented on the results, made more tweaks and repeated ad-nausea until he'd made everything just right. Not everyone in the community was 100% comfortable with some of the balance changes (which are not extreme by any means) but this mod has stood the test of time and only the upcoming SCP mod will displace it. Until then, it's been thought of as an unofficial patch to the game for all stuff it fixes. 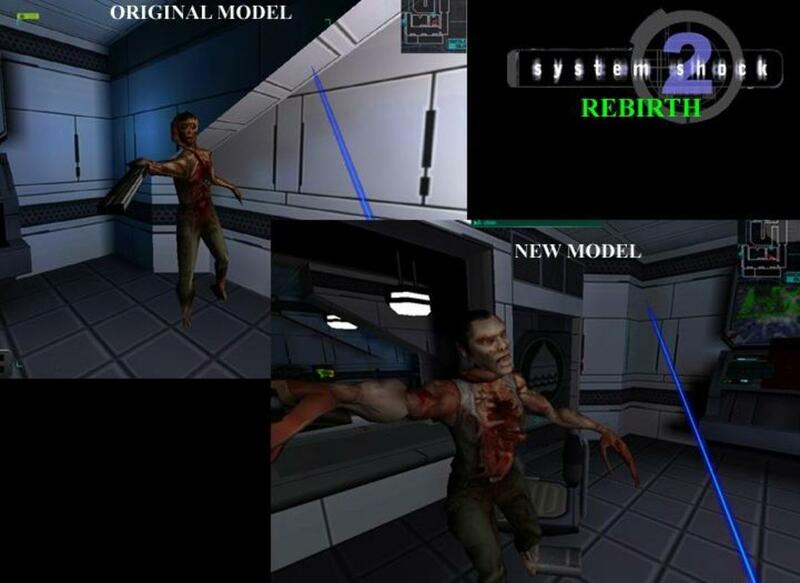 It should be noted that several other mods are designed to work with it or come in variants that work with it because the authors felt it made little sense to design their mods for the original gamesys. This highly popular mod (just look at how many posts have been made in the forums) makes SS2 into an entirely different experience so you'll either hate it or love it but even if you hate it you will still appreciate how awesome it is. 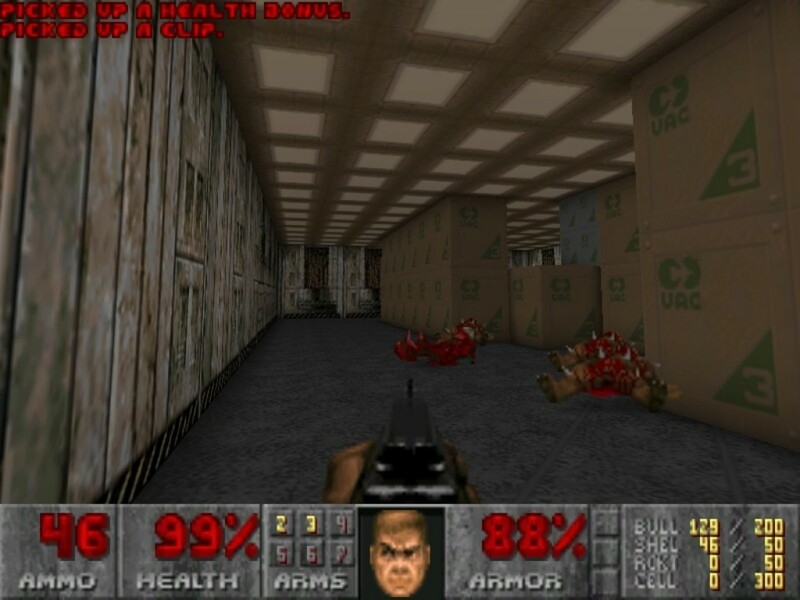 It does several things: adds new weapons and new weapon behaviour, new armor, new items, re-balances the difficulty and generally increases it, allows you to COMBINE certain inventory items to create new items, improves some special effects, fixes bugs, enables new AI behaviour (enemies are smarter and more aggressive), etc. It does many more things that are too numerous to list so the best thing is to watch the trailer video for a taste of things to come! Somewhat similar to SecMod, this mod makes a bunch of changes to the game that make it a new and fresh experience. Most notable are: randomized quest item locations, user-selectable monster spawn levels, particle affects enhanced, modified security system behavior, difficulty increased, hackable robots, re-balancing of the game, new auto-map icons and much more. This mod is quite popular as it offers something new to veteran players and the gameplay changes allow players to discover new ways to mess with the game, since new features inevitably lead to new exploits. This mod appeals to many fans who have commented on how intense the game becomes when you have no idea where to look for stuff and you have to watch your back every 2 seconds because monsters you wouldn't normally see in a traditional play-through suddenly show up in the bathroom, in the beginning of the game and other places you wouldn't expect them. It's particularly attractive to fans who have already played SS2 a few or more times because it increases the replay value and keeps players from becoming complacent at knowing exactly how the game will unfold. This staple mod updates most of the object textures in the game and also corrects many graphical anomalies and glitches like misaligned textures, poor scaling, missing textures on polygons, etc. The "philosophy" of the mod is to leave the style of the texture exactly how it was meant to be and not to change anything that doesn't have to be changed but to make the textures look better by increasing resolution when possible, redoing the artwork, adding alpha or anti-aliasing in some cases... whatever is needed to give the texture a less muddy, blurry appearance. It's a very well done and disciplined mod that has received much acclaim. It's not 100% finished (still in beta) but what's done is significant. This is kind of like SHTUP in many ways except it focusses on terrain and architecture rather than objects (and some tech screens). The author strictly adhered to the "don't change the style" rule and just cranked up the resolution by 400%. Like SHTUP, this is a low risk mod to install, as it simply makes everything look better without changing it. 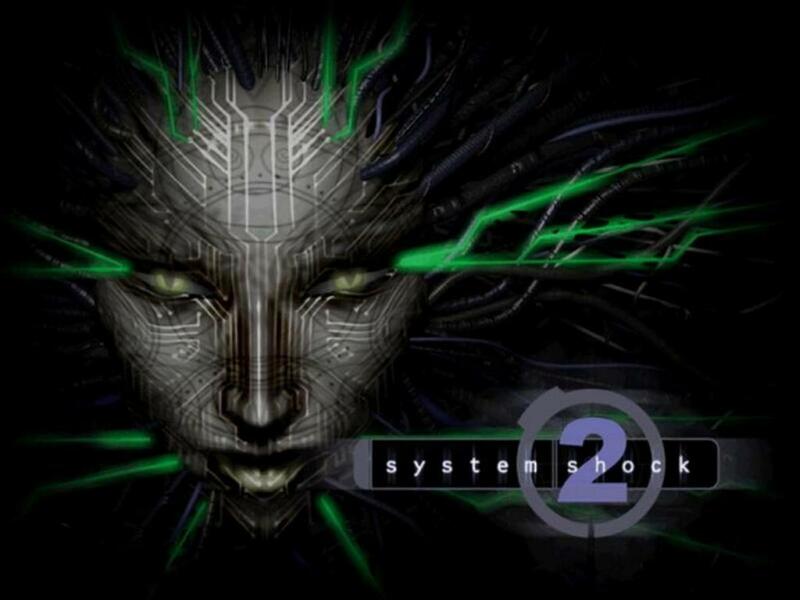 System Shock 2 uses 22 kHz rips of the original high quality soundtrack, which was not available to fans until many years after the release of the game. When we did get our hands on it, the music was "whole" and not broken up into pieces, which the game requires in order to play the correct segments in the correct places. Schatten tore it all up into the pieces the game needed and re-sampled everything at 44 kHz so that the tracks sounded at least twice as good as they did off the CD. In fact the CD tracks had some light noise in the background that several people commented on so these higher quality tracks are sorely needed! This direct replacement mod is cut from the original high quality tracks so I can't think of a single reason why one wouldn't use it. With consideration for challenges in audio compression, dynamics matching, gain and other considerations in audio fidelity, Vaxquis has taken another stab at bringing some of the high quality source music into the game, where doing so doesn't compromise the genuineness of the track. Rebirth is a fairly old mod that started with the work of Cyberblutch and later expanded as he either gave or otherwise leaked more models to the community. These models cover most of the AIs in the game. All the corpses are there, most of the more numerous enemies (like hybrids) are there, monkeys, assassins, rumblers, midwives and whatever wasn't 100% finished, other community members cleaned up. The models are much higher in polygon count and have higher resolution textures. Because this mod is a significant departure from the original style, there has been some controversy about certain models not looking the way they should. The cyborg assassins and midwives for example have received a lot of criticism. The hybrids were also tweaked a little bit to look less like the vampires they started out as. Furthermore, the construction of the body segments has been said to be a bit "chunky". Still, despite the negative feedback on the art direction, the mod is extremely well received by all sorts of fans and is one of the top downloads at systemshock.org. 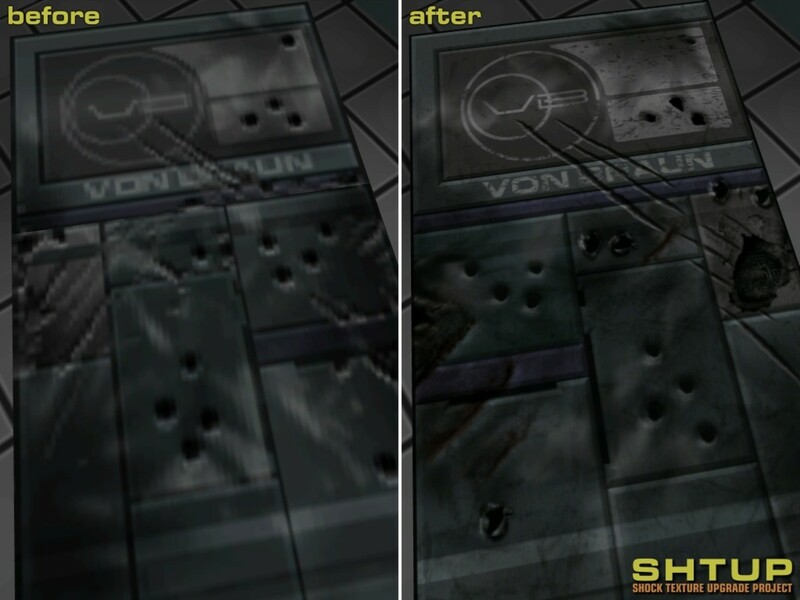 Effect: Repairs many in-game objects that didn't render correctly, were malformed or had some other issue. This mod is meant to clean up models in the game in much the same way that SCP cleans up the game code. It's more of a patch or a bugfix than a mod but obviously you would want to add this to any fresh install of SS2. Effect: It replaces the original protocol droid and droid casket with better ones. Originally an artistic render, RocketMan and Grosnus took this 30000 poly model and got it working in-game at 10000 polygons, with some minor model/texture alterations to better match the original style. There's even a laser beam eye version of the AI and plenty of bells & whistles to enjoy. This would go well with Rebirth, if you chose to install that mod. Nurse Bloome is a personality in the game you will come across. She wasn't given her own character model so RocketMan took Eldron's midwife model (which has a very classic, vanilla look to it) and rigged it to appear in-game where Nurse Bloome is supposed to be. None of the other models in the game are affected. Vurt, over a period of time, released different themed mods replacing various objects and other elements in the game including the space skybox, annelid eggs, all the plants and vegetation on the ship, the water textures, the "goo", and some other stuff. It really needs to be consolidated so it's easier to find but since there is no particular focus and each mod is different, maybe it's also good that people can download only what they want. The level of quality is good all around and for the most part, Vurt seems to stick to the original style of the artwork but not as strictly as the purest of the purists. I find the water, eggs, and flora mods are really nice but it's a matter of personal taste so I would advise looking at all the mods with Vurt's name on them and seeing what you feel is going to suit your game experience the best! Archaniac and Leaf made a very nice replacement model for the ultra low-res default one that comes on the CD. This is only used when engaged in multiplayer so that the people you're playing with can be identified properly. The model has good proportions, an appropriate texture, and a really good facial expression. Unfortunately, it also has an open hand for holding weapons, which looks a bit odd and NO GOGGLES! If not for the lack of goggles, this mod would be right on the mark. Ajare also made a model of Goggles but he never finished it. Years later, RocketMan took that model and had it textured and rigged to work as a multiplayer avatar. While the texture is a bit plain and the model could use some minor tweaks, the model has goggles and a closed hand for weapons. 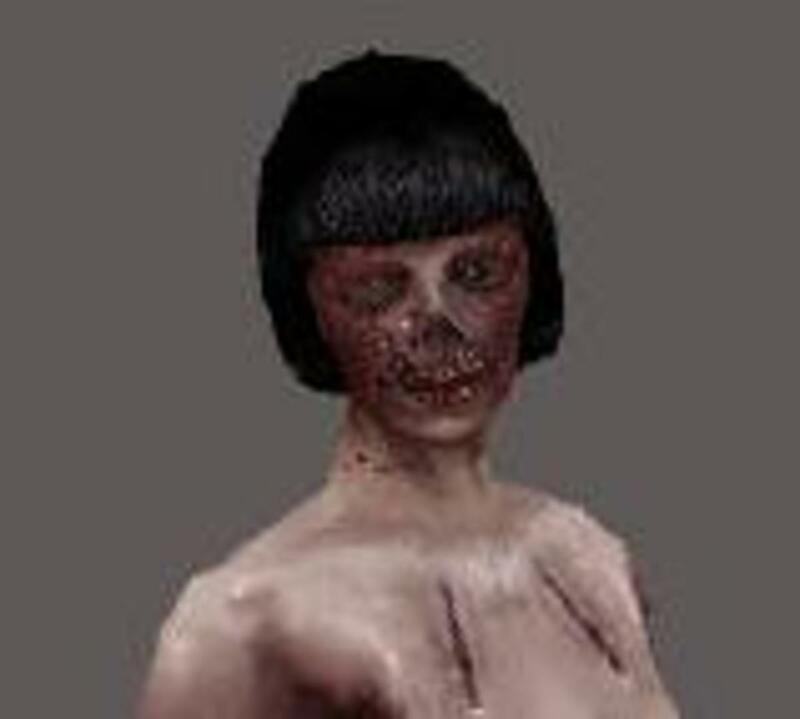 Again it comes down to personal preference which avatar works better for you. Both are much improved over the original so you won't be sorry with either of them. This is the most successful weapons mod available. Unfortunately it doesn't cover ALL the weapons but those he did make are very nice. They all look very close to the originals and follow the SHTUP design philosophy. They have cool new effects like transparent glass and self-illuminated surfaces as well as a functional pistol slide. You'll get a new wrench, pistol, shotgun, assault rifle, laser pistol and grenade launcher in this mod. The pistol, as mentioned, has a functional slide so it has to pair with the right gamesys file. That's why there are 2 pistol downloads to pick from, depending on which gamesys you have. This mod, like Tacticool, is a weapon replacement mod. The intent was to keep the weapon style the same although the end product is arguably different in some respects. Still, it's fairly close and while the level of quality isn't quite up to Tacticool standards, the weapons are ALMOST ALL weapons that Tacticool didn't do so if you don't want to play with a combination of old and new weapons, this mod may be a good idea. It includes the wrench, psi amp world model, crystal shard, viral proliferator, annelid worm launcher, stasis field generator and fusion cannon. 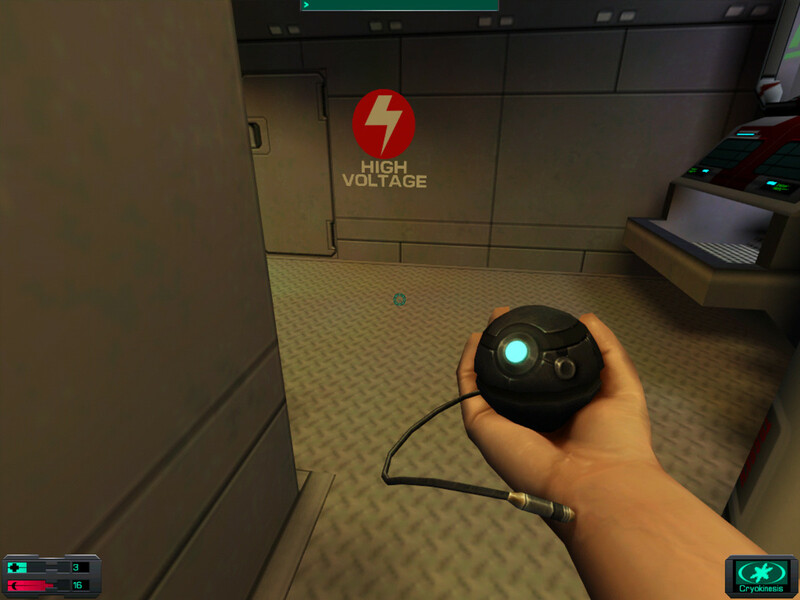 It also features animated textures, transparency, self-illumination and other little improvements. As a side note, the only weapon not covered by mods in this article is the laser rapier and even that weapon is available in different colors. I should also note that the laser rapier is so ridiculously simple in construction (basically a colored line) that it doesn't really benefit from a remake. This is the HAND MODEL for the psi amp only. That means when you're looking at it on the floor you'll still see the original and will only see an improvement when you're equipping it. RocketMan has the world model if you're interested and it's slightly simplified over this one but still a good match. This psi amp has gotten a lot of good feedback even though it doesn't look exactly like the old one. It's been dubbed the "death star" from Star Wars because of it's resemblance. The stylistic differences aren't jarring and the hand model is quite nice so it's a good compliment to the other upgraded weapons. Effect: Increases resolution and detail of the EMP rifle with a fresh look. 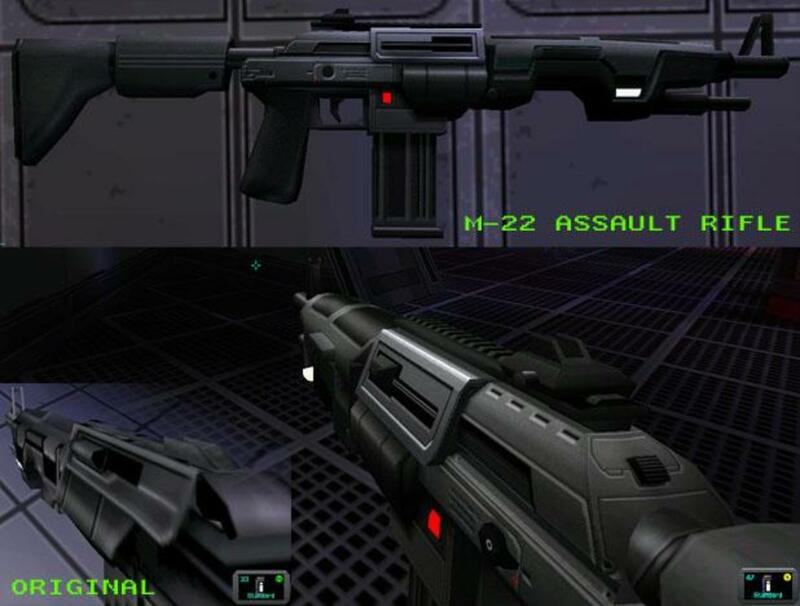 This mod updates the EMP rifle with a somewhat re-imagined version that still looks similar to the original in a lot of ways but is still obviously different. It's got a nice animated screen on it and a glow in the dark sort of effect going on too. If you're looking to upgrade all of the weapons or happen to think this one in particular needs a facelift, this mod is a fine replacement for the old one. There's also a file called SS2_EMPRifle_Mats.7z on the download page, which adds animated texture illumination, if you're so inclined. Effect: It removes audible warnings that a camera has seen you and is about to go off. Ordinarily, cameras beep at you to announce "Hey over here! I see you!". 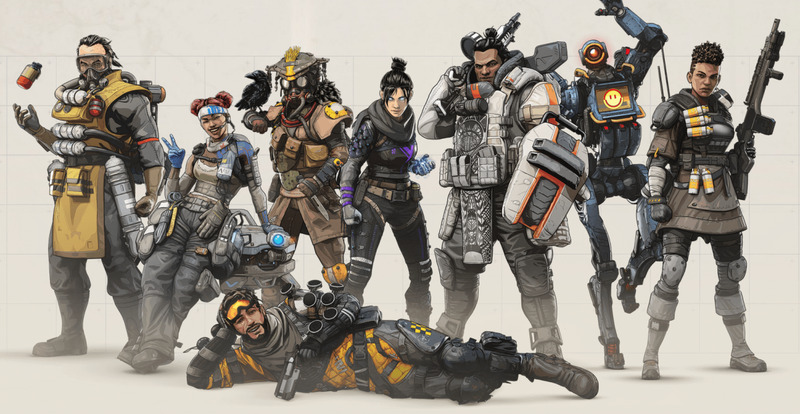 While this is a design choice that was probably meant to balance the game a bit, allowing players a chance to save themselves from a security onslaught, more advanced players find it a bit of an immersion breaker. This mod makes the cameras almost silent, leaving only their faint swivelling motor sound. This is a very simple mod that changes the style and color of the in-game mouse pointer and the reticle in the middle of the screen. You simply pick which version you want and download the corresponding mod file for installation. This nifty mod allows you to unlock ALL of the GamePig games, even the ones the developers never included in the public release, but were found buried in the game files. 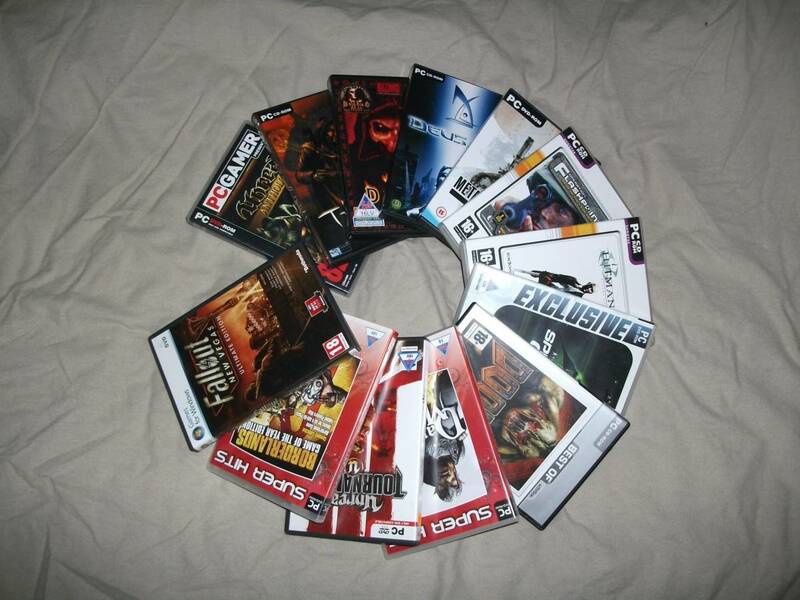 You have to hack the GamePig to gain access to these extra games but at least now they're available to play. 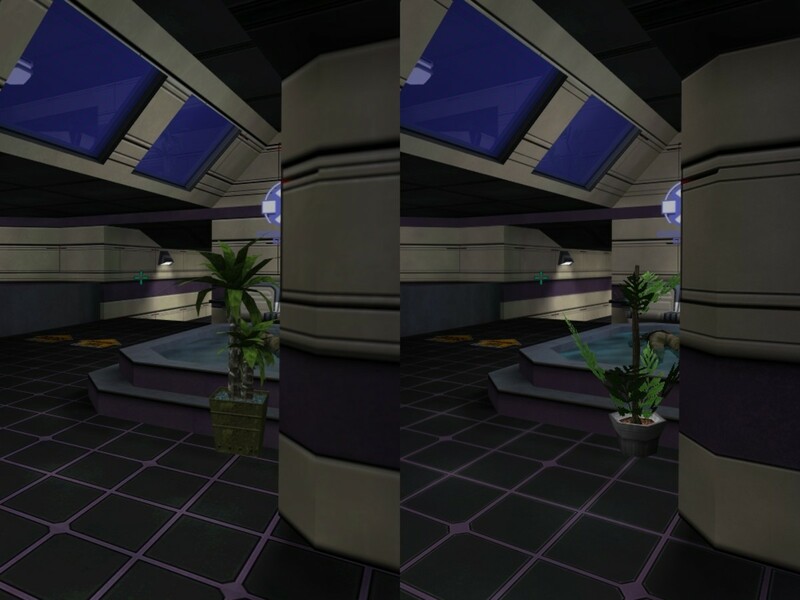 Effect: It changes the architectural color scheme (back) to the one that the original System Shock used. It also emulates the animated color cycling that SS1 had as well. This mod only applies to the "Where Am I?" level of SS2 that looks like the hospital level of SS1. Since the developers of SS2 decided to do their own thing with this level even though it's supposed to look like an area of SS1, many people consider it more of a style change to go with the original textures than to use this mod. It's been widely accepted that Goggles' cybernetic rig is capable of displaying all sorts of information that wouldn't be accessible to normal human beings (otherwise why have it?). This includes displaying the current health of any enemies you're firing at. 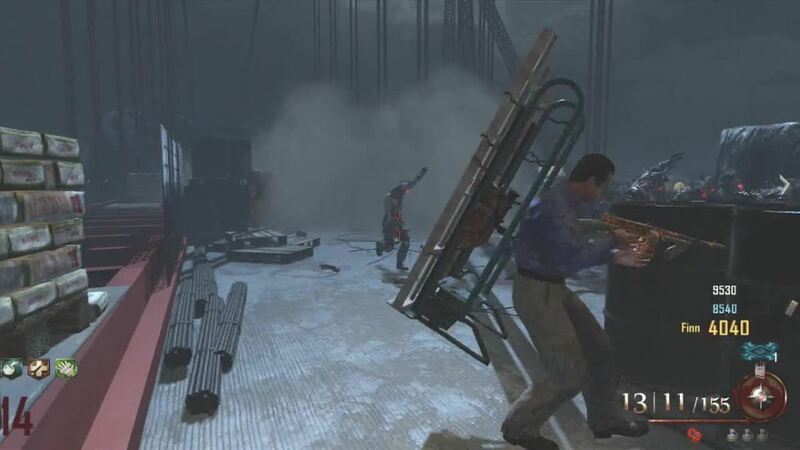 However some fans believe the game would be more of a challenge and add to the tension if the health bar were either vague (Optimal, Damaged, Critical) or nonexistent. This mod gives you that option. Effect: This is a program that organizes, enables and disables all your mods. No article on System Shock 2 mods would be complete without giving you a way to nicely organize them all after you've downloaded them. Blue's Mod Manager serves the same purpose as Zombe's old Mod Manager and basically provides a means for you to import your mod archives, sort them, turn them on and off and all without worrying about resource conflicts or folder paths. 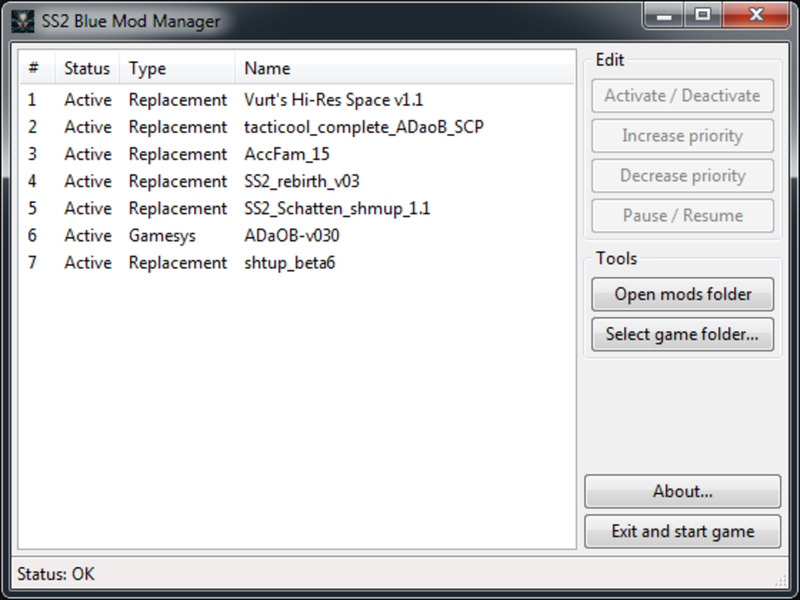 If you're going to be using a lot of mod's it'd serve you well to also use a mod manager. If you would like to be a part of the modding community for System Shock 2, there are plenty of bugs to be corrected, fan mission authors in need of help, resources in need of an overhaul and dreams yet to be fulfilled. You may think you lack the expertise to contribute in a meaningful way but you'd be surprised at how simple it can sometimes be to lend a hand with voice acting or play-testing as an example. If on the other hand, you do have a specific skill set like 3D modeling, 2D artistry, script programming, etc. or you're a fast learner, you can start by studying how the game works and how to use the editor, which is integral to most forms of modding. SShock2.com has a page here you can start with for the basics. After that, you can head over to systemshock.org and click on the tab at the top of the page called MOTHER, which will guide you to specific knowledge bases, some of which contain the necessary information for creating your own mods! System Shock has an active community of selfless contributors, and it's still going strong. Every improvement and every mod opens up the possibility for new ways to enjoy an old game... one that has certainly held up well and continues to earn respect from gamers today. I imagine the list of available mods will continue to expand in the coming years, giving me a reason to come back and update my list but that won't be a chore since I'll know that someone else's hard efforts to share their love of this game necessitated it. 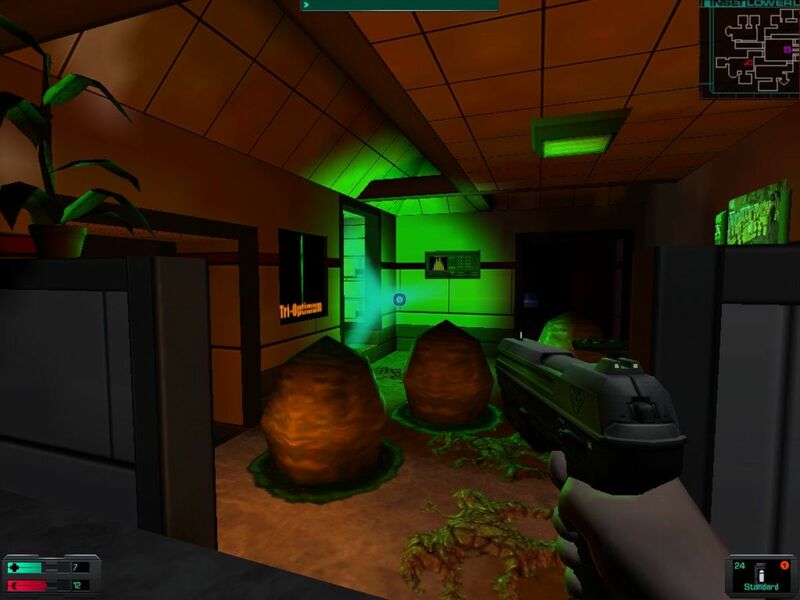 What sort of modding skills do you have to offer the System Shock 2 community? I'm a C/C++ programmer and can write scripts. I think I'd be able to master SS2's editor "ShockED"
I create and mix musical scores. I'm a creative designer who can write character dialogue and plot elements. I'm willing to assist in any way I can, given direction from an experienced modder. Can I assume from your hubpages account handle that you are in fact the author of the mod you are disputing ? That's awesome. Be careful of the re-releases. They are sometimes borked and the best thing to do is just head over to SystemShock.org and get Kolya's patch to make sure your install is the most up-to-date. Played it AGES ago and just got it on Steam again. Looking forward to an improved experience with mods. I'm glad to hear that. There are some really cool developments still in progress so check back from time to time and you'll find new updates as mods come out! Thank you. Just bought the game and your guide was very useful. That tends to happen from time to time because after 20 and 15 years respectively, the games are just that good. Thanks for this list, I have plenty of fun memories of System Shock 2 and might have to try out some of these mods next time I have the itch to play. It's good that you played them in order. I didn't and I regret it, even though the game is still fun to replay. Thank you very much for this comprehensive article (this is how I found your site BTW). I played System Shock 1 in my teenage years (with a guide... my english back then just wasn't good enough to beat this game), and boy what a ride it was. I have since heard of the sequel, but it wasn't until the GoG/Steam release that I could finally put my paws on it. I look forward to document my playthrough on the TTLG forums, when I will finally start. Yes they will work but the included instructions may be misleading because most mods were made prior to NewDark. Just be aware that NewDark's directory structure is a bit different and mods should go into "DataPermMods" or you should use one of the NewDark compatible mod managers listed in this thread. 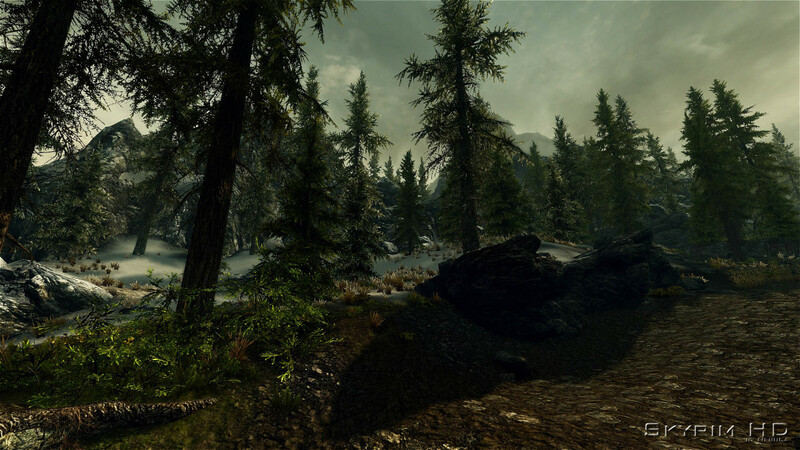 Do the community mods work on the NewDark version? If you haven't played it yet, I'd recommend SS1, SS2 and then have a look at my other hub on mod recommendations. You won't be disappointed!